Christopher Hitchens is often irascible and infuriating and wrong--but not in this article, where he questions why Muslim beliefs, laws and practices are entitled to respect simply on account of being Muslim beliefs, laws and practices. He cites his puzzlement over this story about a fellow being arrested "on hate crime charges" for throwing a Koran in a toilet. As a former library and bookstore clerk and an avid bibliophile, I don't condone the destruction of books, but why is it a crime to flush some tomes and not others? Is there a secret list somewhere of books that may be flushed without subjecting oneself to criminal process? "In a recent column, S. Amjad Hussain wrote that one should not "confus[e] freedom of speech with a license to demean a faith and thus insult Muslims everywhere in the world." Unfortunately, it is Mr. Hussain who is confused about freedom of speech. What is free speech if not a license to say things with which others may disagree or may not like?" Now for some other comments, just for you. I confess to being curious--have you actually seen the cartoons that are at issue here? (If you haven't, I'd be glad to send them to you.) And if so, can you explain how they insult Muslims everywhere in the world? What is the nature of this supposed insult? 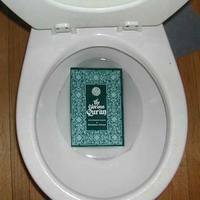 --the way some Muslims claim a religious basis for their censorious impulses. Are you claiming that these topics must be off-limits to writers and cartoonists? Are you arguing that these topics are examples of "profanity"? You write for a newspaper--you practice freedom of speech. I find it disappointing that you seem to be arguing for a kind of self-censorship. I wish you had come out foresquare in favor of the right to criticize people, religions, beliefs and practices. I hope you will reconsider your position. His reply didn't answer the fundamental questions I posed: what is the nature of a supposed insult to Islam, and does his interest in avoiding such an insult really trump other people's right to free speech? At least one of us is definitely confused. 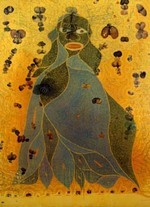 Yes, I have seen the cartoons and they are repugnant to me the same way the movie The last Temptation of Christ and the painting of Mary done in dung was repugnant. I will not put curbs on individual rights to free speech but I will ask that the people of conscious [sic] would condemn such blatant attacks on another faith. The points you make in towards the end of your e-mail, treatment of women, jihad etc., are rather silly. Those are minority views and to tar every Muslim with a broad brush will be like condemning all Christians for the ranting of a handful of Christian fundamentalist preachers on the extreme right. Regarding making certain topics off-limits I have addressed the question in my column yesterday. Perhaps you will consider writing letters to the media urging them to demand repealing laws against free speech in Europe. Thank you for your thoughtful response. There are certainly some things we can agree on--for instance, the laws in some European countries and the proposed law in Israel that restrict free speech when it comes to the holocaust, blasphemy, and other issues. I share your opinion that these laws are violations of the right of free speech and ought to be repealed. As to other issues, I am still trying hard and in good faith to understand your reasoning. You wrote in your column that the cartoons demean the Muslim faith and are insulting to Muslims everywhere. You wrote in your e-mail that they were repugnant to you. I'm still trying to understand how and why. Take, for example, the cartoon which shows a cartoonist working in his study with the shades drawn and only a single lamp illuminating his work. He is working on a drawing--presumably of Mohammed--while perspiring nervously and trying to shield what he is working on from prying eyes. This is a commentary on the fear that writers, artists, and cartoonists experience when they address issues related to Islam. How is this cartoon repugnant or demeaning? Take another example, the one which shows a bearded, black-turbanned man (again, presumably Mohammed). The turban morphs into a bomb. This is a commentary on how a few extremists have committed terrible acts of violence supposedly in the name of Islam. 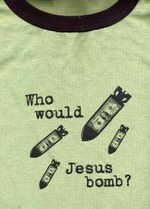 It reminds me of a T-shirt my son owns which says "Who would Jesus bomb?" which is a commentary on how some American leaders have attempted to justify terrible acts of violence in the name of Christianity. So again, how is that cartoon repugnant or demeaning? Please understand--I do not for a minute question the genuineness of your convictions and interpretations. I just don't understand the chain of reasoning that leads you to them. The cartoons are repugnant to me because they willfully demean my faith and me. It is no different when Christians (and other people of conscious [sic]) take offense when Jesus or Mary is willfully insulted. We may not take to the streets but the hurt is there. And there you have it: it is what it is (a contemporary verbal tic I truly despise). It's insulting because it's offensive and offensive because it's insulting. You must not be disrespectful of my religious views, however ludicrous they may be. You must even refrain from pointing out how ludicrous they are. How ironic that a belief system that purports to hold great truths and lessons retreats from the give-and-take of discourse when challenged and falls back on circular arguments. Adherents of any religion that wants to be taken seriously would do well to get over their tetchiness.